hello folks, it's been a while i haven't posted here ! edit: i did reallise one thing that i totally forgot : what is my goal ? i use the metters units setup because i can't find the pixel units setup :/ well, you're welcome to download my model for to see how they work and of course, once i get feedback and finish the modular model, i will share it on SDK thread from other forum. next time, i will try to create some texture in pixel art for the modulat model. i did restarted the first module which it's a wall with a bit of green because of vegetations. 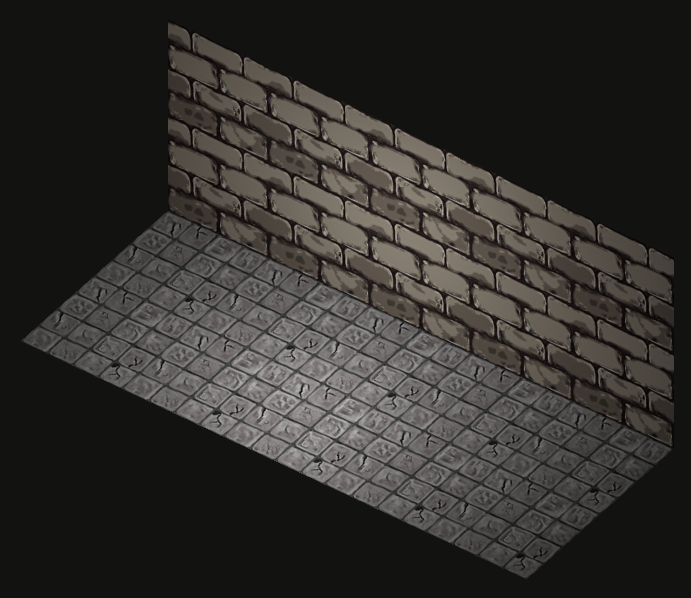 first version of tile ground, i don't know if i do it well but i was based on some ancient tile done during medieval time. The textures could use some more color in my opinion. The shading effects do a lot to make the structure more believable, but the tiles look more like porcelain than a medieval sandstone or something similar. So far so good, in terms of the texture projection. Do you have any new screens to show? sorry for being away so long because i though the forum was down for a while but i can see it's already back ! you were right about color, but idea is to make it faded by the time which it tend to desaturate alot but i will try what i can do with it. you were right, thx alot for the suggestion, i can now edit the wall and the ground, i will also make the wall less detailled like you did showed me.